Saving and Investing: What is Leverage? In today's episode of “Saving and Investing”, Michael Fischer explains a concept I've heard mentioned a lot, but have never understood. The term “leverage” is used in many financial books and articles, often referring to real estate investments. The concept has always puzzled me, even when I looked it up. Michael's explanation is short and to the point. Leverage makes perfect sense now. A home mortgage is a common example of leverage in practice. In general, a homebuyer has only a small amount of the purchase price. Most of the money for the transaction is borrowed from a bank. House prices tend to increase with time. By using leverage to purchase a house, we're able to magnify our return on equity. 1. The use of various financial instruments or borrowed capital, such as margin, to increase the potential return of an investment. 2. The amount of debt used to finance a firm's assets. A firm with significantly more debt than equity is considered to be highly leveraged. On Monday, Michael explains financial statements. Then he dives into stocks, bonds, and financial markets! There are 19 reader responses to "Saving and Investing: What is Leverage?". Many investors (traders) use leverage in their brokerage account in the form of buying stocks on margin. This is very dangerous though since you are mangnifying your the dollar amount and increase your risk by borrowing money for a higher net return. Do you remember the bad feeling you had when your stocks went down? Just multiply that by 1000x when those stocks you bought are with borrowed money. Buying a house on mortgage is generally a good idea because real estate eventually will go up assuming you are patient enough but other forms of investment might not always go back up. Also note that you need to pay interest on borrowed money, so your return needs to cover the interest (this is obvious but very important don’t forget this). For those that want to start trying this, I would suggest starting out small (borrowing a small amount) so you get the feel and get used to doing this, then grow your borrowing once you start getting comfortable since it is very easy to panic when you are borrowing money to invest and it takes experience to stay calm. Visit My Own Millions Blog for more thoughts and ideas on personal finance! please take this for what it is worth – but this guy’s stuff is verrrrrrry basic and poorly presented. How can you write a finance blog and not understand EXTREMELY basic concepts such as leverage? I like a lot of the stuff here, but I’m starting to question the value of any minute spent here…. Now, I have a CFA and an MBA and I apologize for the harshness of my comments. Despite all the work I’ve done in finance, I still realize that I have a lot to learn and seek out other resources. But come one dude – all this stuff is very basic. You should probably just start linking to good stuff rather than actually offering your own opinions on complex fianancial matters. Blogs are a medium to share our knowledge and learn together as opposed to teaching everyone what exactly should be done. People like us write blogs to give others a way to learn (either linking to others’ posts or sharing what we know). I like this blog because JD is honest and write interesting articles that I can learn from, not necessarily because I think JD is an expert in personal finance or holds a Masters in Finance. I will continue to support this blog. Leverage is not evil as long as one understand the concept of risk and money management. I would recommend anyone considering leverage (for example 4X in stock day trading to 10X in forex trading) to do careful analysis and study of it beforehand. You can be lucky once or twice but consistent positive average return requires more than luck! fair enough, but if you don’t understand the most basic principles of finance then why would you write a finance blog? i agree that jd is honest. however, after his admission that he doesn’t understand his subject, how can you possibly accept anything he writes? 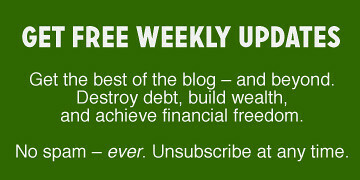 Not everyone who has a pf blog is necessarily an expert at ALL things financial. Many people do it to share what they know, track their own progress, be accountable to themselves, get support from a community. I enjoy JD’s blog immensely as he is one of the best writers and not to mention, nicest bloggers around. Many of the things we write about are basic but are great reminders to others. Kudos to those of us as well who remain honest about what we do and do not know, and have the modesty to admit things. I believe you will agree that we will go nowhere in this argument. I can understand your point of view but I just want to say that JD has worked hard and this blog has become quite popular and successful. This is because of his the work and thought he has put into his articles and the way he allows his readers to relate to him, as opposed to pretending to be the expert in this subject. I applaud that. Sir/madam — you, me, everyone who comments at this site are just “ants” swimming around in the “afterbirth” from what J.D. has created here. For what it’s worth, I was linked to J.D. Roth’s work via millionaire businessman Marshall Brain, creator of the web site How Stuff Works, one of the most popular and respected web sites in the world today … Mr. Brain found enough value in J.D.’s work to bother POSTING about it on his own personal blog. So, yeah. Part of the greatness of this blog is travelling with JD through all sorts of real-life questions and struggles dealing with finance. JD tirelessly provides all sorts of sources in a variety areas related to finance, frugality, and related topics; but at the same time, he makes it perfectly clear that he’s a layman who’s trying to educate himself for life. Does a person have to be an expert in order to share his quest for self-improvement? I hope not. There are plenty of people out there who have already “made it” and who are willing to share their success stories; that is great, and some of them are even experts in the area of their struggle. But some of us appreciate climbing the mountain with engaged people who are still very much like us. JD does a great job of locating sources and bringing them to the table. Are all of these sources perfect? Probably not, but that’s why we discuss them. If it hadn’t been for this blog, I never would have learned about many of the recognized experts and wannabe experts on various financial themes. This blog has been very enriching, warts and all. “ants”, swimming in the “afterbirth”…um, ok there Dave. I enjoyed the article alot…I thought it was very informative, but the comments on this one are going in a very strange direction. We start off with a shameless plug for another site, then to a troll, then ants in afterbirth…hmmm. While I too hold advanced degrees, I can find alot of worth here. Even if the leverage discussion is basic, its a useful review. In dancing, one occasionally retakes the basics to reaffirm one’s dancing base. I don’t understand where muntz’s hostility comes from. JD clearly stated the the encyclopediac definition confuses him but Michael youtube program does not. If JD and co here weren’t providing solid information or advice, I wouldn’t spend time here. I strongly suggest that the basics, no matter how far afield and expertish we are, are nothing to scoff at. Some effort has been made here to waste our time by leveraging the conversation away from the point of this blog which was to aid all of us in gaining a clearer understanding of the term. One aspect that hasn’t been discussed is the way that the language which puzzled JD “A firm with … more highly leveraged.” can also seen from a linguistic approach to represent the macho language of Wall Street where being heavily indebt can somehow by the sleight of word change be seen to be a sign of strength and business acumen. As someone who has seen a stock brokerage gleefully sign up his partner to a margin account, I can tell you this, it is really important for each of us on a personal finance level to understand these basic terms no matter how simple they seem to the sophisticate. To somebody without such advanced business training, this may well be the first time they’ve been exposed to such a discussion on some of these topics or it may be the first time that information has really clicked for them. Some people don’t retain information as well when they read it versus when they hear it for example. I don’t understand where this hostility is coming from either. I had a basic understanding of these concepts already, but I’ve enjoyed the presentation here and I don’t appreciate the tone of criticism against JD. NO, it’s not the depth of knowledge you got in your MBA — but come on already! You spent how many years taking classes? Your professors had many hours over which to unfold the topic. And Michael is giving the 2 minute overview. How advanced do you expect him to get in a YouTube soundbite? Jerry, you have some good points. I hope I have some good responses. 1. Of course this stuff is very basic. It’s meant to be. I’m presenting it as part of Financial Literacy Month. It’s meant to be a foundation upon which other stuff can be discussed. Neither Michael nor I are pretending this is anything other than basic financial information. Actually, that’s the point. 2. I don’t write a finance blog — I write a “personal finance” blog. There’s a subtle but important difference. I have no background in finance. I’ve struggled with money all my life. I’m beginning to win this struggle. I’m learning about money, and as I learn, I try to share that information with my readers. I don’t know certain basic concepts, and I’m willing to admit that. My target audience isn’t those with CFA and MBA degrees, but average everyday people who want to know more about money. 4. I try not to offer advice on complex financial matters. I may write about my experiences, and link to outside resources, but I’ve never claimed to be anything other than an amateur. When I do give advice, I limit it to things I know about. 5. While your complaints are justified, it would be more helpful if you found examples of “good stuff” for me to link to so that I could share the info with the other readers. Or, better yet, offered to contribut a guest post. Seriously: you have the qualifications to to help others. I’d be happy to share something from you. 6. Finally, I try not to post about things that are beyond my ken. For example, I’ve never posted about leverage before. I’ve never posted about buying on margin. I’ve never posted about investing in real estate. I’ve never posted about any number of financial subjects about which I have no knowledge. When I do post about subjects, I limit my writing to the stuff I know. If a person ought not write about a subject just because they don’t know the entire subject, then perhaps I oughtn’t to be doing this. However, I believe there’s great value in sharing what I do know, and in sharing the learning process. Get Rich Slowly is meant to be a resource for those who want to learn about money: how to earn more, how to save more, how to keep more. Not everything I post is appropriate for every reader. It can’t be. I like Michael’s video series — even in its “poorly presented” form — and if it can help even one person, then it’s worth having posted it. Nothing wrong with getting readers to think a little about the concept of leverage in financial matters. Without leverage the wheels of commerce would grind to a halt in some cases, but of course it’s a double edged sword. Leverage can be the crack cocaine of speculative investment junkies who might do heavy trading on margin or in option accounts eventually succumbing to heavy losses. You still want a solid underlying asset to form the basis of any leverage, and getting a mortgage to buy a good house makes sense. Please keep up the dialogue J.D., and continue to share your observations on personal finance. If readers want dry, mathematical, academic analysis of financial matters they can find thousands of such texts at their local library covered in dust. Muntz, what you should really be worried about is reading stuff from bloggers or writers who act like they know something but in fact, really don’t. Personally, I think THAT is what really hurts the personal finance blogosphere. J.D. never does this, not at least from what I’ve read, which is something that I really respect. An option allows a person a leveraged approach to buying or selling stocks. An option is defined as the right to buy or sell a particular security for a specified price on or before a specific date. The specific date is known as the Expiration Date. You’ll hear the pontiffs on CNBC talking a lot about a stock moving due to the upcoming Expiration Date for the options on that particular stock. To confuse you a little more, the stock, when part of an option, is also known as the “security” or the “underlying”. An option is a nice tool, but it isn’t free. Similar to the “vig” in sports betting (short for “vigorish”), the brokerage gets a part of the action for setting up this option. One party buys the option and one party sells the option. The cost of the option is the “premium”. I personally consider it a way for someone to handicap the play. Now depending on where you are on the option, either buying or selling the option of the security (underlying), you have another term or two to digest. The right to buy is known as the “call option”. The right to sell the security is known as the “put option”. Most of the time, I consider the “call option” because I think a stock will go up in price. Here’s a quick example that may put the whole transaction in perspective. I like a stock, and feel I know something the street does not know. The street thinks that stock is a $10 stock, and I know that next month it will be $15. I look for an option on the stock, a “call option” and find that I can buy a call option for $0.75 per share for a “strike price” of $10/share. In the U.S., the options are sold in blocks of 100 stocks. If you want 1,000 shares, you’ll buy 10 blocks. Other countries are different, but since I live in the greatest country in the world (hint: United States of America), I don’t care. The call option comes with a date. Let’s say it has a May 15th expiration date. I buy this call option for the premium price of $0.75 x 100 or $75. I have now bought the right to exercise a sell of this stock at whatever the market will bear, with my cost of $75. If the stock price goes up, over $10.75, before my expiration date of May 15th, I make a profit. The profitability of an option primarily depends on the rise or fall in the price of the underlying stock or futures contract. In this case, my profitability is based on the rise of the stock price because I bought a “call”. This call cost me $75, and yet I can “control” 100 shares x $10 = $1,000 worth of this stock. This is a great tool to have when you do not have much money (as James J. Cramer pointed out in his book, “Confession of a Street Addict”, as he traded between Law School classes, using calls or puts, with very little money down). It is also a great option for when you would like to limit your exposure to risk (see what I did there, I used the verb form of ‘option’…..college….well worth the cost). When the stock price goes up, you can either sell the call (it’s now worth more, the difference between the premium and how much more the stock is selling for, above $10) or exercise the option (and force the seller of the option to supply 100 shares for $10, which you can now share for the higher market rate). Most people that buy options, sell their call, for the option’s new higher value, rather than exercise the option, to avoid having to outlay the money for completion of the option’s transaction. If I decided that I would let my expiration expire, because the stock price went down, I would only sacrifice my “premium” of $75. Had I bought the stock for $10 x 100 shares, or $1,000, and the stock went to $8/share, I would have lost $200. I can also work the other side of the deal, and sell a “put” in much the same way as I bought a “call”. In that case, I would be doing so because I think the stock will go down in price before the expiration date. As you can imagine, the volatility of the stock price and the time to expiration are the main factors in the value of the option. Stocks are not the only thing that an option can be placed on. You can also use options for futures and indexes. Once you run through the call or put scenario a few times, it starts to makes sense. The remainder of the language associated with options involves how close the stock price is to the strike price you are buying the option for. An option that is ATM or “At-The-Money”, is when the stock price is at the strike price. If the strike price is below the stock price, it is ITM or “In-The-Money”. If the strike price is above the stock price, it is OTM or “Out-Of-The-Money”. Let’s review. If you think a stock will go up in price, you buy a “call” option (you’re “bullish” on the stock). If you feel the stock will go down in price, you buy a “put” option (you’re bearish on the stock). You can find options on your on-line broker’s website. This blog entry was an effort to introduce you to the world of options. If you never buy a call or a put, please do yourself a favor and visit the Options area of your on-line broker and take a look at the outstanding calls (left side) and puts (right side). There will be a number of blocks (100 shares) in one of the columns, in the row that also contains the strike price and premium. Above the matrix, you can choose the month to find the calls and puts for that month. By studying the sheer number of calls and puts, at certain strike prices, the market is telling you what they think the chances are of your stock going to a new price. If the cost to buy a much higher strike price is high, and there are not that many blocks available, the market is telling you that your stock has a high likelihood of getting to this higher price, and no one really wants to sell you that action. This is very valuable information that you can gather as a “lurker”. I have a question regarding leverage I thought I’d throw out there. I’ve discussed this with my wife, but she doesn’t like the sound of it: I get offers from my credit cards (all at $0 now!) to transfer a balance at 0% for 12 months. There is a balance transfer fee of 3% however. My idea is to use this money, pay the 3% fee and invest it in a Certificate of deposit. Now my credit union offers 11 month certificates at 4.75apy with a dividend of 4.65% and dividends are credited monthly. Lets say I “leverage” my credit cards money; $10,000, pay the 3% transaction fee of $300, but then turn around and earn 4.65% on that money. After 11 months I’ll have earned $434.61. When my account matures, I’ll take the $10,300 from my CD and pay off the credit card, netting me 134.61 of free money. Am I right or am I missing something? I know this will entail making minimum monthly payment to the credit card, but I would just get that back when I pay off the credit card (the balance would just be lower.). Any insight? Well then isn’t leverage the same as playing the lottery? It is basically gambling right? I’m trying to learn what leverage is also. I thought it was power, an advantage, a strategic position that will more than not bring success. From reading here it is described as good or bad.